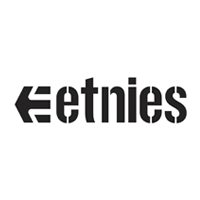 Etnies was formed in 1986 and is part of the Sole Technology Group who also produce Emerica and Es footwear. The company is owned by ex professional skateboarder Pierre André Sénizergues who designed some of Etnies most iconic shoe styles. Etnies prides itself on being 100% skater owned and in 2003 they opened the Etnies skatepark in Lake Forest, California where the company is based. Aswell as being a rad independent shoe company, Etnies also contribute towards the ell being of the planet through their "Buy a Shoe, Plant a Tree" campaign which saw a tree planted in the Maleku Rainforest for every pair of Jameson 2 Eco's bought. In 2015, Etnies announced a milestone in it's campaign: it's one millionth tree planted. The Etnies skate team consists of names such as Ryan Sheckler, Chris Joslin, Jamie Tancowny, David Reyes and Willow to name a few. Etnies produce high quality skateboarding footwear which is perfect for anyone who supports core brands within the industry.